The apostle Paul had heard a report about the Corinthians: "I hear that when you come together as a church, there are divisions among you, and to some extent I believe it" (1 Cor. 11:18). 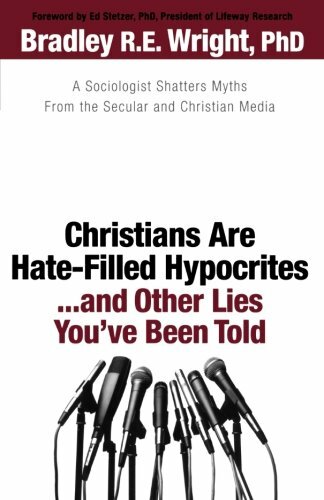 In Christians Are Hate-Filled Hypocrites … and Other Lies You've Been Told: A Sociologist Shatters Myths From the Secular and Christian Media, Bradley Wright encourages a similar mindset as he gives an overview of statistics about Christianity in the United States: Listen, but keep your healthy skepticism about what you hear. Wright points out the many reasons statistics can get garbled and exaggerated. (You may remember him as the sociologist who attends a Willow Creek Association Church but who pointed out graciously and devastatingly that Willow Creek's Reveal study does not reveal much.) In Christians Are … , Wright is generally gentle in his criticisms, and his humor is winsome. His tone is well-adapted to an informal college classroom, and he writes from a Christian perspective, so his book would be ideal for pastors, lay people, and students at Christian universities and seminaries. Christians Are … is particularly valuable because it shows how contemporary books, newspapers, magazines, and blogs routinely perpetuate myths about Christians in general and evangelicals in particular. Wright looks at whether the church in the United States is growing; whether Christians are maintaining Christian beliefs, church attendance, and moral behaviors; and how Christians are perceived by outsiders. He places statistics in perspective. Are Christians faring better than non-Christians? Are evangelicals faring better than non-evangelicals? Does more frequent church attendance improve results? And are things getting better or worse? The news is mixed—not what Christians would hope it would be, but usually better than the comparison group. There are four main themes implicit throughout the book worth drawing out. First, statistics about American Christianity can be salutary for Christians as they seek to be faithful to God. Wright doesn't simply dismiss the cynic who tends to scorn social statistics because they are often so flawed that they produce more confusion than insight. But his book also shows that ignoring sociological research altogether leads to ignorance and its unintended negative consequences. Without sociological research, people only observe a small slice of American religion and can only speculate on whether their experiences are representative of the whole. Writers, professors, and pastors inveigh against problems which they think are widespread but which were really just a big deal in the church they grew up in. They end up ignoring other serious tragedies because of their stubborn myopia. In a sense, to be reflexively dismissive of sociological research is to be like the priest and Levite who passed by on the other side of the road where a man lay bleeding (Luke 10:31-32). The priest and Levite think, "I already know what is important." Whereas to be a neighbor means to be open to being surprised about what is going on and to render help. Wright's introduction to the data allows the reader to see how severe and widespread certain issues are. For example, Wright reports that Christians in general, and evangelicals in particular, fared quite well by almost every standard he looked at. But then, Wright says, "I got to the research about Christians' attitudes toward minorities, and I was utterly dismayed." The issue of race deserves continued attention, says Wright. Reading this book can be like walking to the side of the road--only by taking a closer look can Christians direct their efforts of compassion and justice. Second, there is a chronic and destructive carelessness in the way many people use statistics. Too often, Christian and non-Christian pollsters, speakers, authors, and journalists downplay contradictory data, hype shaky conclusions, pass on rumors, show disdain for methodological rigor, prognosticate outlandishly, and bully those slow to believe them. Wright catches a number of Christians exaggerating, swept away by enthusiasm as they seek to drum up support for their causes. "Churches will be empty in a generation so … everyone needs to join my organization." (See also Christian Smith's Evangelicals Behaving Badly with Statistics in the January/February 2007 of Books & Culture.) Surely the biblical admonitions directed at those who stressed "myths and endless genealogies" applies here, "Such things promote controversial speculations rather than advancing God's work … they do not know what they are talking about or what they so confidently affirm" (1 Tim. 1:4, 7). In contrast, the discipline of sociology at its best prizes healthy debate, attention to detail, and explicit admission of limitations.